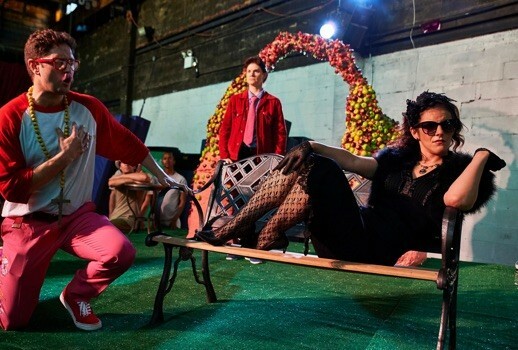 Although I had seen LoftOpera’s two special summer presentations last year, I hadn’t attended a full-scale opera by the group until Thursday night’s premiere of Le Comte Ory. Returning to Bushwick’s The Muse, an enormous space that usually functions as a circus school, Loft offered an unusually satisfying, immensely entertaining production of Rossini’s scintillating portrait of an inveterate seducer—and with all tickets just $30, it’s an irresistible bargain! Cobbled together from chunks of Il Viaggio à Reims, his pièce d’occasion written for the coronation of Charles X, Rossini’s delightful French-language Ory is done far too rarely, waiting until just five years ago for its Metropolitan Opera premiere. The difficulty in finding a suavely charming tenor for the title role, one who can cope with its daunting high tessitura no doubt explained why the Met waited for the availability of Juan Diego Flórez to produce it. Loft’s Ory, Icelandic tenor Thorsteinn Arbjornsson, made a brave and sometimes successful stab at conquering the role’s demands. His weak middle and lower range tended to disappear too often, but his many high Cs and Ds rang out strongly, while his modestly low-key portrayal proved uncommonly charming. 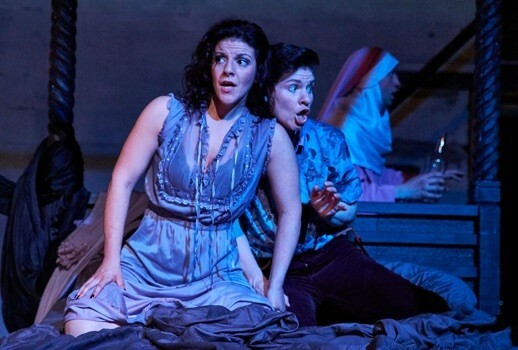 Director John de los Santos’s energetically appealing updated production happily eschewed over-the-top broad comedy and allowed Arbjornsson to soften Ory’s predatory behavior by gently beguiling the smitten ladies of the chorus. Decked out in Ashley Soliman’s fanciful hot pink suit abetted by the randy Raimbaud of Steven Eddy, the disguised hermit twinkled slyly but harmlessly. Once in his next disguise as a nun in another outrageous pink outfit, he made the most of his wry attempts at seducing the not-so innocent Comtesse Adèle of sparkling soprano Sharin Apostolou. Grown bored waiting for her husband’s return from war, the glamorously self-dramatizing Apostolou made a swell entrance clad in widow’s black and soon revealed in a grand cabaletta full of cascades of frilly coloratura that she was more than tempted by the attentions of Isolier, Ory’s page, superbly portrayed in travesti by the shining mezzo Elizabeth Pojanowski. The production’s particularly impressive female contingent was completed by the primly stern and rich-voiced Ragonde of Shirin Eskandani. Sean Kelly’s fleet and boisterous conducting reveled in Rossini’s bubbly comedy although Arbjornsson and Eddy were occasionally overwhelmed by the vibrant if uneven 31-piece band. The magnificent first-act finale drawn from an even more complex ensemble from Viaggio threatened to go off the rails at moments but still made its thrilling impact. Kelly included the Tutor’s long and demanding scena which adds little to the story, but one was grateful as bass Jeff Beruan sang with it with stylish verve while unfortunately overdoing the doddering “old man” business he was saddled with. One of Loft’s most engaging qualities is that it achieves so much with so little: Ory took place on several three-foot-high platforms placed in the center of The Muse, accessorized with only a few props including the necessary bed for the second act’s sublime trio. Although I’m not sure everyone in the audience could see the ribald goings-on on that four-poster, de los Santos’s wryly raunchy staging of Adèle, Isolier and Ory cavorting in the darkened bedroom was the evening’s inevitably delicious high point. Its three performers sang soulfully while carousing with sweaty delight. 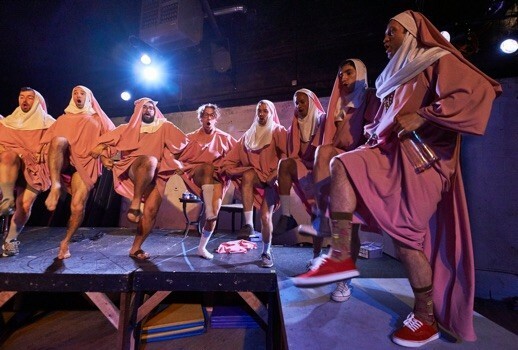 It was even more fun than the earlier drunken saturnalia of Ory’s coarse male cohorts, also fetchingly garbed in pink nun’s habits. A hilarious bout of half-naked Twister followed by an enthusiastic kick-line of hairy, stomping religieuses brought the house down. All these delights plus dazzling pre-performance aerial routines by Nicki Miller and Chriselle Tidrick and the availability of affordable wine from Archer Roose and beer from Brooklyn Brewery made Loft’s Comte Ory one of the season’s most delectable evenings, despite having to endure some of New York’s least comfy chairs and benches. Four more performances of Ory remain through June 11 but they will surely soon sell out. I’m eager to see what Brianna Maury, Daniel Ellis-Ferris and LoftOpera have in store with Mozart’s challenging Così fan tutte, their next project coming in September!